He was asked a simple math question - but his response was genius. This image shows a six-year-old boy's incredible - and - answer to a question on a recent school math paper that has left his mother feeling 'proud' and certain that he is 'going places'. The American youngster, known only as Dash, was firstly asked to work out whether 'Bobby', who had four dimes, or 'Amy', who had 30 pennies, had the largest sum of money. But then, he was asked: 'How do you know? Show your thinking?'. In response, Dash simply drew a stick picture of himself scratching his head, with a thought bubble containing the answer. After his mother, Fiona, saw his brilliant answer, she couldn't resist proudly sharing it. Unsurprisingly, the picture quickly went viral, receiving more than 6,000 'upvotes' on the website. 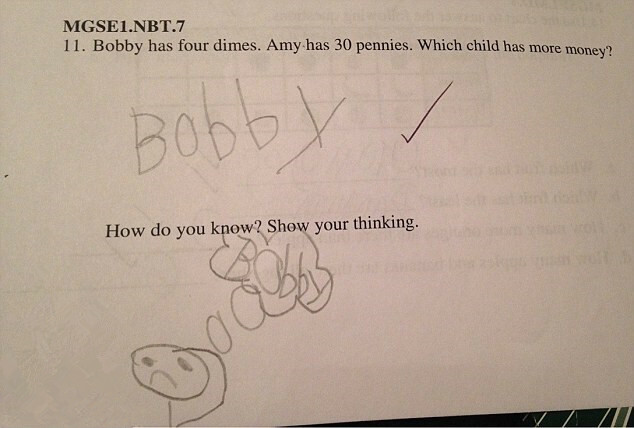 On Imgur, many users agreed with the mother's opinion that the first-grader is 'going places'.